I'm a skinny jeans kind of gal. However, I've been looking to change things up. Once I tried these "Love Story" bell bottoms by J Brand I was sold. They elongate my legs and look great with fun summer tops and will transition easily into fall. I think I found my new favorite jeans! Ummm can't believe how long your hair is now! Loving it and the outfit! I, too, am a skinny jeans type of girl, but I do love my J Brand Love story bells! Probably bc they are still very slim through the thighs and knees. I like to switch things up a bit from my skinny jeans too! That orange Parker top looks great on you!! Cute top! Love the detail. I love this look. 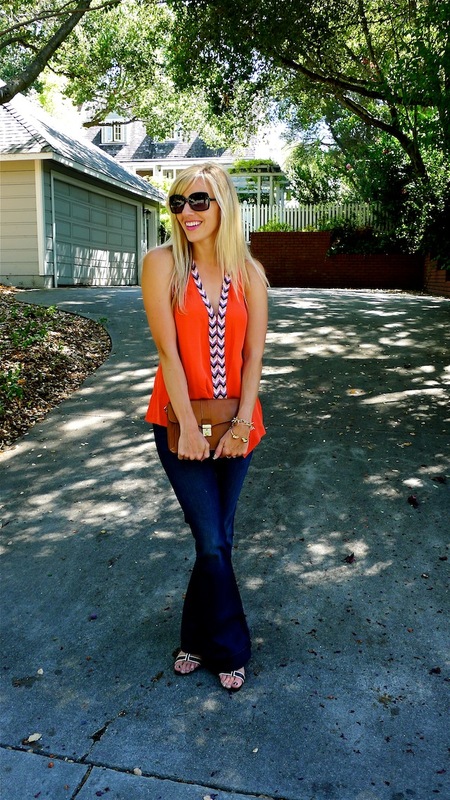 The top is such a fun, vibrant color, and I always prefer the look of a good flare jean. When I saw the post title, I thought it might be about your wedding! These jeans are adorable, though. What height heel are you wearing with them? That top is excellent! Great outfit! I love this look! I really want these jeans now! Love the top! So bright and perfect for summer! Fabulous jeans and top! Looking great! Those pants are awesome and I LOVE them with the gorgeous top. There is nothing like finding a great pair of jeans! They can be such a pain to shop for. These look great. J Brand Love Story seems to look great on just about everybody!! I'm dying to try them! I own a pair of the J Brand lovestory flares, too...can't get enough of them. Love them on you! ohhh i love those jeans! i'm so happy to see bell bottoms coming back!! You look absolutely fabulous in those flared jeans! You look great in flares! That top is great! Love the look! I love wide legged pants! They are so choc and they totally remind me of the 70's , I like the top you paired the with! i LOVE my skinnies but i totally need to change it up too! these look PERFECT for fall! they look great! and i'm loving your bangs in this photo! I used to be an avid fan of your blog - it had a fresh perspective, great photography, and good style. I can't help but vomit in my mouth a bit whenever I see c/o head to toe. You're no longer relateable - companies pay you money/send you free clothes to play dress-up at home. This rainbows-and-unicorns land has lost all its appeal. Please consider wearing some of the clothes YOU picked yourself so we can see that YOU are actually a style blogger and not a free model for these brands. Love your shirt! It's gorgeous! Those jeans look fabulous on you! I love the trim on that top! Love the jeans, definitely a fresh take on denim! Those jeans look AMAZING on you!!! You look fab in those jeans. Stunning top!!!! You very beautiful!!! Amazing look! Taylor, you look GREAT! I love the jeans, and that color is phenomenal on you! you look amazing!! !that top is so cute and I love your pants!! What a simply chic look! Those pants are perfection! love the outfit! especially the clutch! I too am a skinny jeans gal however I have those exact jeans and they're the perfect go-to jean. Love your style & loved your BCBG dress via instagram. GORGEOUS!! I love these!! Happy wedding weekend woman. enjoy every minute. That blouse fits you perfectly, and the overall look is just fantastic! I love this outfit! The orange is a beautiful colour on you and a fab combo outfit. I have put this as my out fit of the week. Congrats on the wedding!! You looked absolutely stunning! they do look wonderful on you and totally elongate your legs - I must try a pair myself!! INPINK Giveaway - 100 winners! This color was made for you, looks great. I like the flare on the jeans. Very cute! I love bell bottoms too! They are so Parisian chic! Hi Taylor! If you happened to be wearing a striped dress yesterday walking in dt LG, then I saw you! haha, as creepy as that may sound. I live in LG and I love reading your blog, especially because it's local. I adore your fashion and if I hadn't been driving when I (think) I saw you, I definitely would have come up to say hi and tell you how much I love your blog. I was sad to read your post that you will have to be posting less, but that is understandable with all that you do. Just know we will all be here to support you either way! Always remember to put your happiness first, as they say. Loving these flared jeans on you! This style really is very modern and flattering! Chic!! Now you have me thinking about flared jeans, oh that outfit looks so classy. Awesome outfit and she looks lovely! I love this entire outfit! Those bellbottoms are so perfect year round. LOVE the outfit, and I'm actually obsessed with your hair. I wish my hair looked like that! Your pants are so cute! That top is fantastic! Love the whole outfit! you look wonderful. your blog is full of inspiration! brillaint pants and blouse!